"A brilliant premise executed with dazzling flair!" What a pleasure to see two of my favorite historical romance authors team up once again. 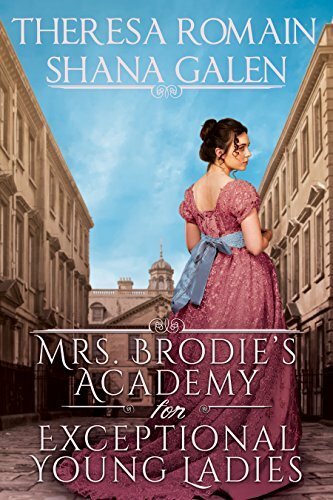 I was eagerly anticipating MRS. BRODIE'S ACADEMY FOR EXCEPTIONAL YOUNG LADIES and the anthology exceeded my expectations tenfold. The authors' vastly different styles mesh seamlessly as they both illustrate the two facets of Mrs. Brodie's Academy. Theresa Romain whose dreamy lyricism and gorgeously descriptive prose know few equals in historical romance tackles the more gentle side of things, while Shana Galen's edgy and dynamic writing demonstrates clearly why she is the queen of Regency romantic action-adventure. The Way to a Gentleman's Heart by Theresa Romain sets the scene for the anthology, explaining smoothly the mission of the academy, while briskly introducing several characters. This story takes place mainly in the kitchen, as Marianne Redfern is head cook, and where we are privy to what it entailed. But Marianne also teaches self-defense, which leads to a very entertaining episode. Ms. Romain takes us on a shopping expedition in Regency London which felt so authentic, I could picture myself being there. There is a startling plot twist that I never expected, and which I had despaired of ever seeing, which made the reunion between Jack Grahame and Marianne so much sweeter and leads to extraordinary character growth. Counterfeit Scandal from Shana Galen gives us the other side of the Academy where Bridget Lavery teaches art and counterfeiting, and the way she came about it was not at all how I had imagined. There's plenty of action and drama, as Bridget tries to find Jimmy, the son she had to leave in an orphanage when she was sent to debtors prison. Ms. Galen provides some fascinating details on Regency counterfeiting and the gritty and dangerous London where Bridget searches for her son. She is a fierce and loving mother, determined to do anything to get Jimmy back. Counterfeit Scandal is all stark realism, and passion; if Bridget's past is heartbreaking, Caleb's backstory is positively riveting. They had loved each other passionately, and the steam these two generate is palpable. Counterfeit Scandal is fraught with peril and I wondered if Bridget would ever find her son, and her happily ever after with Caleb; it all seemed so dangerous and hopeless. I loved how it all came together in the end, but it was a very close call! I hope the authors are conscious of the monster they have created with MRS. BRODIE'S ACADEMY FOR EXCEPTIONAL YOUNG LADIES: readers are going to clamor for more because this anthology is filled with so many wonderful characters that are begging for their own stories to be told. Bridget Lavery moved among her students, observing their penmanship. It was her last class of the day and comprised of about twelve girls ages eight to ten. Officially, she taught art, reading, and penmanship. What was counterfeiting currency but the melding of art and penmanship? These pupils were too young to try their hand at actual counterfeiting, but they were learning to copy the styles of writing on various bank notes issued by England, as well as other countries. “That’s very good, Susan,” she said as she peered over the shoulder of a thin blond girl. Most of the work in this class looked rough and unrefined, but Susan’s hand was exceptionally steady, and she had a good eye for her age. “Thank you, Mrs. Lavery,” Susan said, smiling up at her. The little girl had blue eyes, and whenever Bridget looked into them, her chest tightened. Susan’s eyes were almost the same blue as James’s. He would be the same age as the youngest girls in the room too. Just eight. When Bridget looked at Susan’s blond hair, she wondered if James’s hair was still blond, or whether it had turned darker like her own. Bridget forced herself to keep moving, to continue nodding and smiling at the girls’ work, but her mind was elsewhere, lost in memories of a smiling toddler, arms out as he wobbled toward her on unsteady legs. Bridget looked at the small clock on her desk. It was indeed almost five minutes past the hour. How careless of her! She had made the girls late to their pickpocketing class with Mrs. Chalmers. Efficient as always, the girls were filing out the door within moments, a sea of blue in their school dresses. As soon as the last girl filed out, Bridget gathered her personal items and rushed to follow. This was the worst possible day to be caught daydreaming. She had an appointment at half past four near Covent Garden, and she did not want to be late. She stopped by the room she shared with Mademoiselle Valérie Gagne—who taught French and accent modification—pulled on gloves and a hat, and rushed down the stairs, past a ballroom filled with older girls practicing sharp kicks to hay targets, and out the front door. A few minutes later, she was jostling among the crowds on Piccadilly, wary of pickpockets, ignoring the cries of hawkers, and trying to stay clear of carriages with overzealous drivers. The boarding house was farther than she would have liked, but she couldn’t afford any of the rooms in Marylebone. She’d investigated every vacancy. She located the street she sought, turned right, and slowed. The street was not as busy as many of the others and not at all what she would call safe. People sat in doorways and watched her pass. As she was dressed little better than they, though her clothes were cleaner, they mostly ignored her. Bridget carried a knife in her pocket just in case. She’d never had to use it. On occasion, she’d had to pull it out, whereby the lad—almost always a young boy or boys—accosting her decided she wasn’t worth the trouble. Usually, she never brought blunt with her when walking alone. Today, she had a shilling tucked in her glove. The rest of her savings was safely hidden back at Mrs. Brodie’s Academy. Bridget doubted even Valérie could have found it, not that Valérie would ever steal from her. But Bridget didn’t trust anyone. Yesterday, when Valérie had been teaching and Bridget had an hour’s break, she’d locked their door, pried up the floorboard, taken the money out, and counted it. She had twelve shillings and six pence saved. It wasn’t much, considering, but she hoped it would be enough to rent a small room in a boarding house. Once she had a room, she could claim James again—if she could find him. Bridget hoped the headmistress was in London at the moment. She often traveled, and she hadn’t seen her for a few days. Mrs. Jacobs led her through a dark common room and up a staircase with worn carpet. The subtle scent of mold and cooked onions lingered in the air. At the landing, Mrs. Jacobs continued to the second floor. Bridget frowned. She had been hoping for a room on the first floor, as the top floor would be hot in summer and cold in winter. The second floor was dark, and Bridget squinted as Mrs. Jacobs led her to the end of the corridor, pulled out a large keyring, selected a key, and opened the door. Bridget crossed to the window at the other end of the room, all of six steps, and opened the curtains. The window looked out on another building and down into an alleyway. She closed the curtains again. “It’s a shilling and two pence, and I won’t take less.” Mrs. Jacobs folded her arms over her chest with finality. Bridget would not be deterred, however. For almost two years, she had been working toward the goal of reclaiming James. She had a plan, and obtaining a room was the last step before she sought James. She needed this room, dingy as it was. Mrs. Jacobs hesitated, then began to shake her head. Bridget nodded, removed her glove, and placed the shilling in Mrs. Jacobs’s palm. It was gone in an instant. “It will take me time to send for him,” she said, keeping her answer vague. “He won’t.” Of course, she couldn’t know that. She hadn’t seen James since he was barely three. She didn’t know what sort of boy he’d grown into in the intervening years. And yet, she was well-versed in dealing with unruly children. She could handle her own son, and she would. She just had to find him first. She’d gone to the orphanage where she’d left James before she’d been sent to Fleet Prison with Robbie, but the St. Dismas Home for Wayward Youth had burned down, and no one seemed to know what had happened to the boys who’d lived there. She hadn’t known how to go about discovering more. She considered hiring an investigator to look into the matter, but she feared the expense would be too dear. Mrs. Jacobs, evidently convinced she’d shown the new tenant enough of the room, motioned her out and locked the door again. She began what sounded like a well-rehearsed speech about meals and noise and visitors as she led Bridget back down the stairs. Bridget made sounds of assent, but she was looking at the cracked paint on the walls and wondering what James would think of their new home. What would he think of her? Could he ever forgive her for abandoning him? Finally at the front door, the two ladies said their goodbyes, and Mrs. Jacobs opened the door for Bridget just as a man was opening it from the outside. “Pardon me, ladies,” he said when he saw that he had blocked their way. Bridget began to say something along the lines of, It is nothing, sir, but then she looked up and into his face. Those eyes. She knew of only two people in the world with that exact shade of blue. One was James and the other his father. Caleb Harris felt his smile fade. There had only ever been a few times in his life where he hadn’t known what to do. Seeing her again was one of those rare times. He’d known it might happen when he was sent back to England and then to London. He’d prepared several speeches in the unlikely event that he saw her. But looking at her now, her golden-brown eyes riveted to his face, her expression like that of a person who had seen a ghost, he couldn’t think of a single word. Mrs. Jacobs looked from one to the other. He nodded. “A pleasure, Mrs. Lavery.” She hadn’t been Bridget Lavery when he’d known her. Nor had she been married. Of course, he hadn’t been Smith back then either. He took the steps two at a time, withdrew his key from his pocket, and had it ready at the door to his room. Once inside, he leaped over the traps he’d laid and made straight for the window. He pulled the curtains apart and looked out on the street. She was there, just now at the end of the lane. He could still catch her. He yanked the window up, put one leg over, grasped a clothesline, and swung out. One hand on the clothesline, he reached for the drainpipe with the other, then shimmied down and ran to catch up with Bridget. He shouldered past people, earning a few deserved curses, until he caught sight of her plain blue dress and white bonnet in the crowd. With a last burst of speed, he caught up to her, matching his pace to hers and walking beside her. She looked over at him as though seeing him beside her, out of breath and hatless, did not surprise her at all. She stopped so suddenly that he walked on for two or three steps before he realized she wasn’t beside him. He turned and walked back to her. She wasn’t wrong. The last thing he should have been doing at the moment was speaking to anyone who had known him before. Unless he had a death wish. Which he didn’t. She turned and marched away, leaving him wondering and wishing things might have been different.